Retrograde Mercury joined with Jupiter in Virgo encourages you to get your full geek on, as you immerse yourself in the intricate details of a project or plan. Review and revise matters that involve communication, education, marketing or travel. The Sun challenging taskmaster Saturn, makes things harder than they should be and demands intensive work. Here is your Weekend Horoscope. Your detailed astrology reading is waiting! Click here to find out what else is in store for you this weekend. Have the weekend off? It could still be all work and no play because certain tasks demand your full attention. Even your fitness regimen could prove to be a chore. Focus on an uncompleted project that you feel enthusiastic about and rejoice in your ability to finally get the job done. 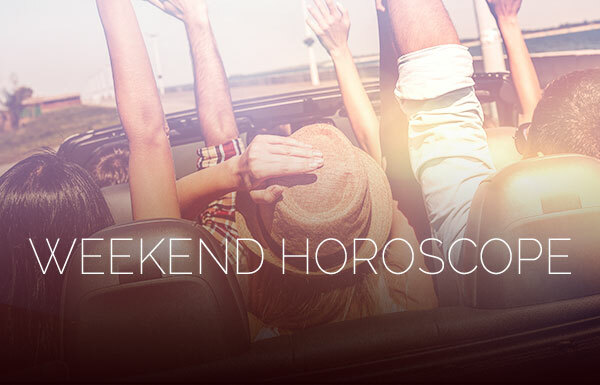 Your Weekend Horoscope indicates that you are feeling pretty optimistic about romance. Despite giving it your all, you could still end up getting the short end of the stick. Once again you are giving too much. The same goes for children and creative projects. You would do well to curb your enthusiasm. You are likely to be immersed in completing projects around the home. Unfortunately, your enthusiasm for what you are doing isn’t likely to rub off on others, leaving you to focus on solo tasks. Be careful not to take on projects that you can’t manage on your own. Non-stop errands, phone calls, emails, and texts will keep you pretty busy this weekend. You might be jazzed to reconnect with certain people, but after a while it tires you out. Turn off your phone and curl up with a good book. Your mind will appreciate a little downtime. Your Weekend Horoscope points to financial wheeling and dealing. This isn’t something new. You have been down this road before. Even though opportunity is at hand, you still need to proceed with caution and avoid taking an unnecessary risk. It pays to temper your enthusiasm with common sense. You will be in your element when you find an activity that benefits from your perspicacious attention to detail. The only drawback is that you place so much pressure on yourself to get things right that you can’t bring matters to a successful conclusion. Forget about being perfect. Go for good enough. Work on a secret project or engage in activities behind the scenes. You can get more done in seclusion. It might be tempting to tell certain people what you are up to, but you should probably keep it to yourself. Bragging is likely to garner a chilly response. People from the past are coming back into the picture. Reconnecting with interesting friends is something that you feel really excited about. So many things to do and so little money to pay for them all. Decide which event or activity will provide the most bang for your buck. People see you as someone with a multitude of talents and they find this impressive. Be careful not to boast of abilities that aren’t really up to par. You could get into hot water if you project an image that doesn’t reflect the true you. Keep it real! You might have plans to travel or to pursue an adventure close to home. Stepping outside of your box and doing something different might feel a little scary. God forbid you should get lost or not know what you are doing! Don’t let fear call the shots. Take a chance! Your Weekend Horoscope shows a lot of input, advice and assistance from people close to you, yet you still might feel as though you aren’t getting what you really desire. Look more closely at what is being offered. There is definitely something valuable in there for you. You stand to benefit from collaborating on a project with someone close to you. Even though you don’t necessarily have the same goals, your shared input could prove to be mutually beneficial. This is a great time to review and revise a recent project because you can see it with a fresh perspective.